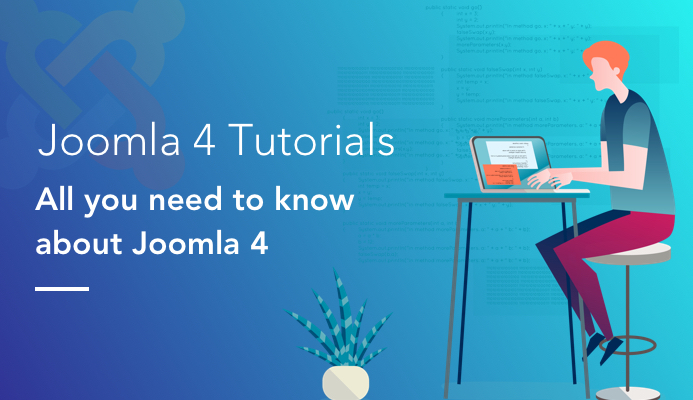 This post, we would like to provide list of useful blog posts about Joomla 4 tutorials, Joomla 4 installation guide, Joomla 4 new features and more with purpose of giving all information about Joomla 4. 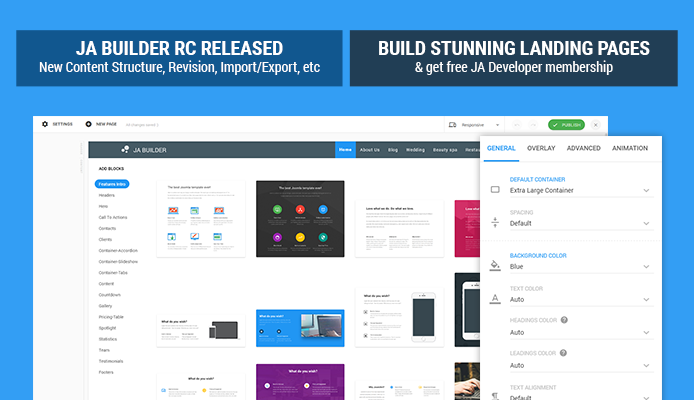 Last week, we released JA Builder RC with lots of features and improvements: new content structure, improved editor tool, page import & export, revision history, popular Framework templates and 3rd Party extensions compatibility. 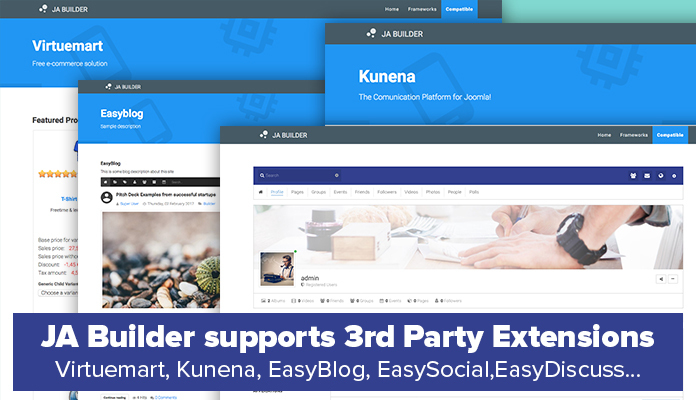 In our last post we displayed how JA Joomla Page Builder works well with popular Joomla extensions. With so many template frameworks around, we tested our page builder tool with them and results are encouraging. With few tweaks, our Page Builder works well with all frameworks and we have documented the same as a guide for our users. 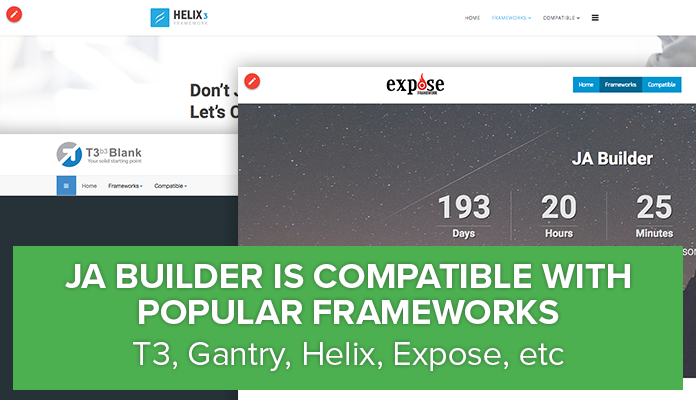 T3 Framework, Gantry, Helix, Expose were included for the first round and here are the results and tips for each framework are mentioned at the bottom of this blog post. 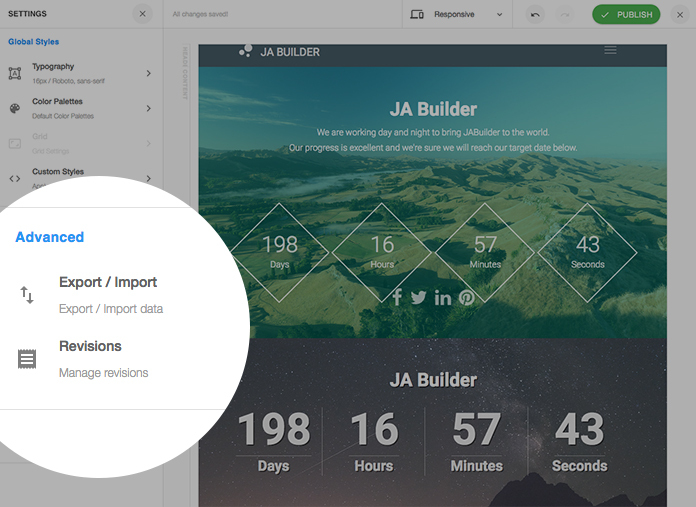 JA Joomla Page Builder will soon be out of beta status with imminent RC release. We at random tested it with popular Joomla extensions and all seems good so far. The Joomla extensions used for compatibility testing were Virtuemart, Kunena, EasyDiscuss, EasySocial and EasyBlog. 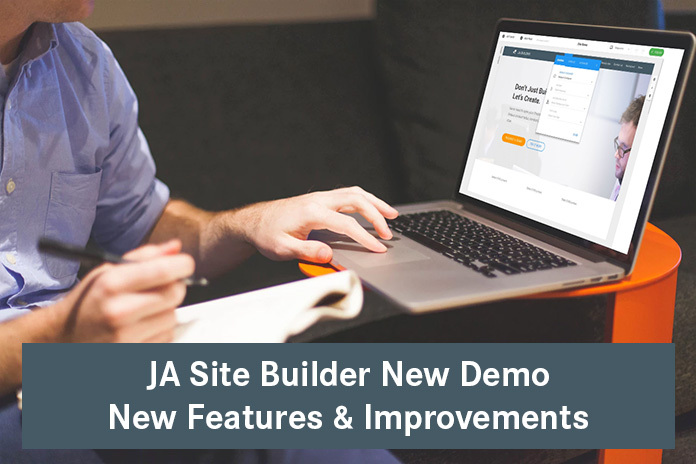 We have also tested JA Builder with other popular Joomla template frameworks and details would be available in the upcoming blog post. 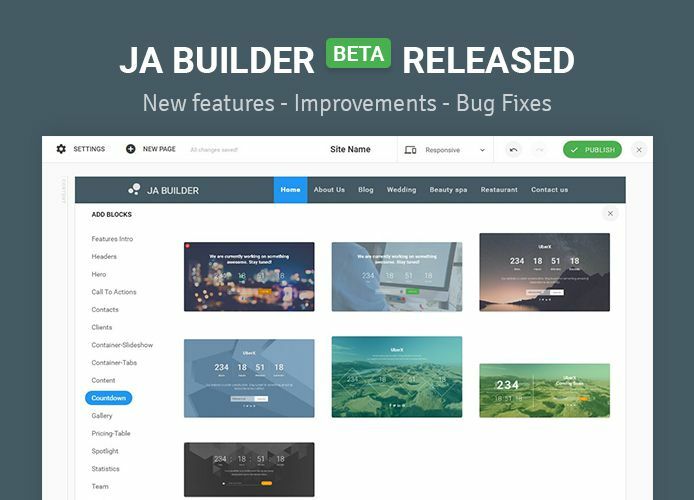 We are pretty close to saying bye to beta version of JA Builder and release an RC version next week, which comes with some major changes and features. One of the features is "revisions", which are stored for restoration at any later time. This feature can be tested on the JA Builder demo and would be part of the release next week. The new feature will auto save the changes you did when editing the page (for now, each revision includes 10 changes). Meaning, after you do 10 changes, it will be saved as a revision. You can revert to previous revision to revert the content, pretty handy feature. 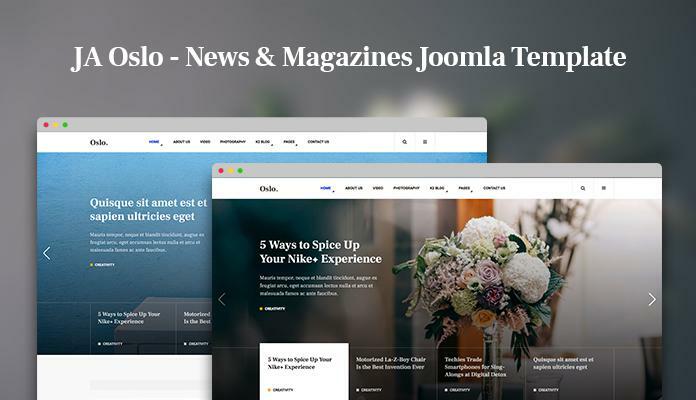 JA Oslo - Joomla News Magazine Joomla template is now available. JA Oslo features unique design and layouts. All our earlier Joomla news or magazine templates shared some common features amongst themselves but for JA Oslo we wanted to try a totally different approach and the Oslo concept preview got mixed reviews from our members but mostly positive. JA Oslo is versatile and can even be adapted for simpler roles even for personal blogs, thats the beauty of it. JA Oslo supports K2 component natively as requested by many of our members and T3 framework is the core as always. Feature highlights of JA Oslo are listed down in the blog. Do check out the live demo and let us know what you think. Be it Page Builder or any editor, Undo and Redo are important feature and as planned we are glad to implement them in the latest release od JA Joomla Page Builder. Taking it further the Page Builder now also supports export and import of pages, now that should make designing landing pages a breeze. More blocks and more settings also made it to this version. Thanks a ton for the feedback and feature requests, its shaping the Page Builder in the right direction. Try out the new version and let us know what more you want us to work on. Landing pages in general are the optimized entry pages to the site for better conversion rates. Landing pages can either be the homepage or could be specific for your ad campaign. A landing page usually have concise information of your service or product with strong call to action buttons and relevant information to convince the user to go ahead with purchase or desired action. JA Joomla Page Builder not only helps to create different page layouts for your site but is also very effective in creating landing pages. 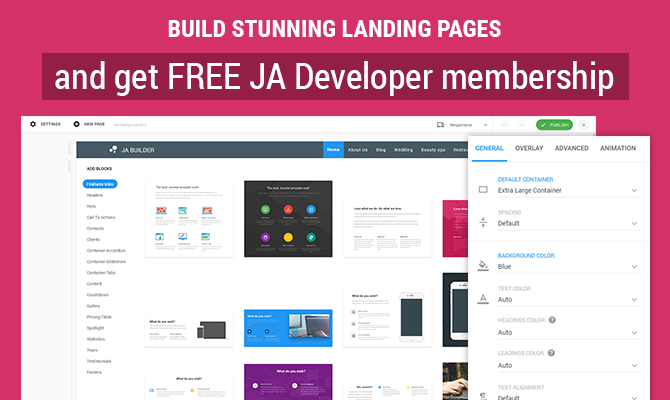 It has all the required blocks to build a landing page quickly. 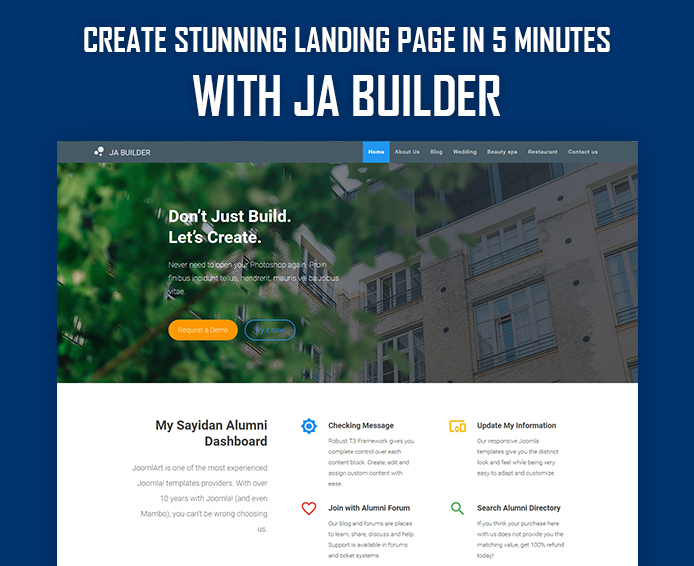 Today we will show you how to create stunning landing page for your Joomla site in 5 minutes, no coding or technical skill required. 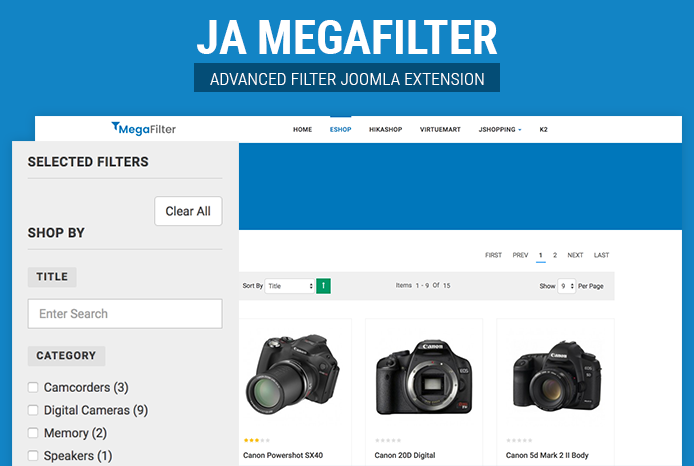 With JA Joomla Site Builder it becomes very easy to build Joomla page layouts and update typographic styles. 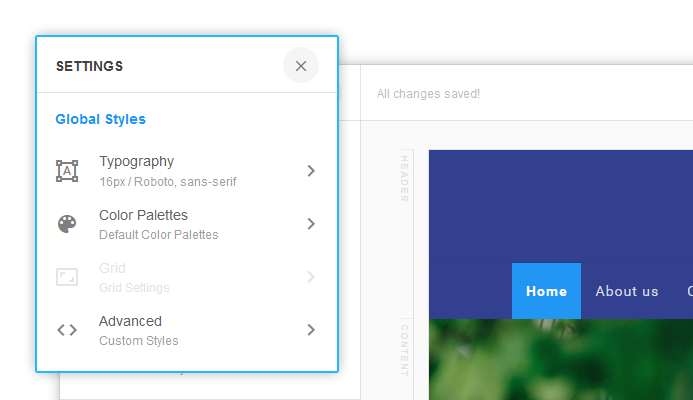 For advanced users who love to implement custom css, our Builder tool supports custom styles for every element of the page. Here are some illustrated examples of how easily one can use basic css skills to enhance the look and feel of their joomla pages right from the frontend. Do try replicating them on your dev sites, its fun learning. 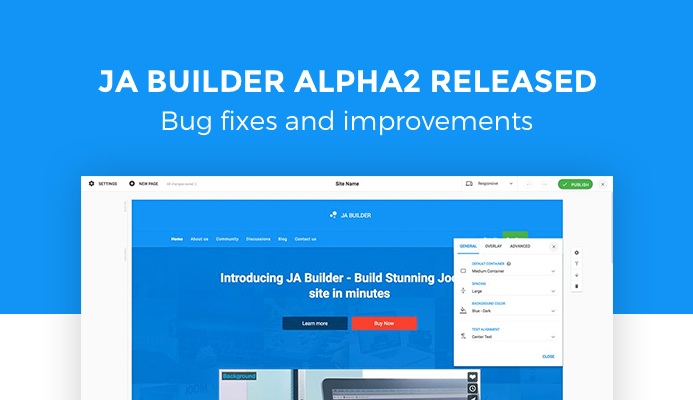 We are so happy that our JA Joomla Site Builder Alpha release got lots of good feedback from you guys, over 2000 downloads so far. Today we released version Alpha 2 with bug fixes and improvements. Our Joomla site builder development is advancing at a amazing speed. This week we added 5 more features and other improvements. With this update our Joomla site builder tool is edging closer to a beta release. Did you know that our aim is to make it work with any Joomla template? Yes, that is what we aim to deliver for our members.